Allie met with her primary GI doctor (Dr. Brown) today. It was just a follow up appointment to make sure things are still going smoothly for all of us. Allie weighed in at 27.2 pounds and is 35" tall. She's doing great!! She's still quite short and is in the less than 5% but at least she's holding her own. Allie started Cyproheptadine about a month ago. This medication is suppose to stimulate appetite if used in very small doses. Is it working????? It's hard to say because her oral intake is still so random. There is however no doubt that she's eating slightly more than she did a year ago - so that's a plus. Until recently, Allie was drinking her elemental formula (pre-digested) E028 Splash, however she will no longer drink it. She is now drinking chocolate milk and that's it. Dr. Brown gave us some samples of the Boost Kid Essentials 1.5 cal. Allie used to be on that stuff a while ago and she actually liked it. We would also tube feed it to her but that's when she was vomiting at every feeding. So, we'll see if she will drink it again - if so, that would be great because it's got a lot of the good nutrients and it's high calorie. Allie's blenderized diet is still going great. In January, it will be 1 year that she has been on the BD and VOMIT FREE! 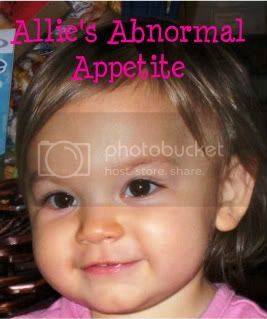 Looking back, one of the most draining parts of Allie's journey so far has been the fact that she vomited every tube feeding for a little over a year. 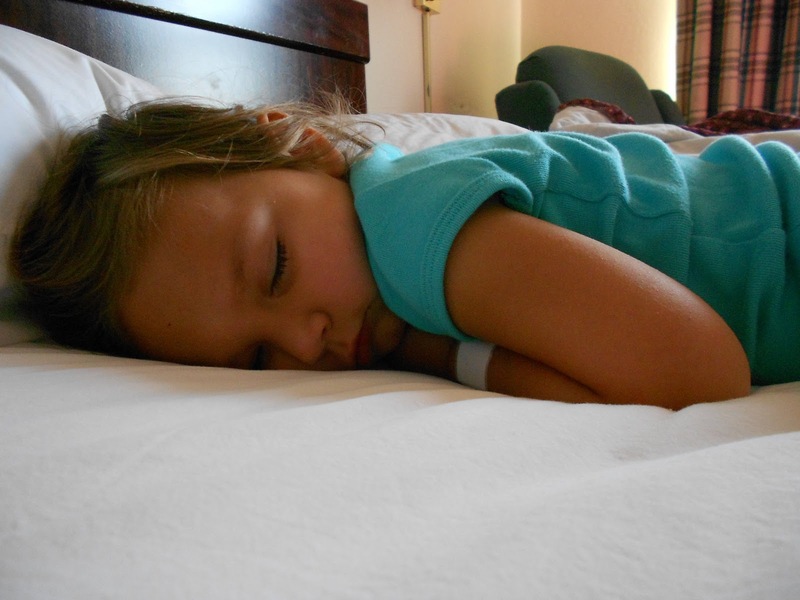 Parents and children can only handle so much vomiting - my heart goes out to all the parents and kids who continue to deal with vomiting everyday. Two months ago, we started adding "Duo-Cal" to Allie's BD and to what she drinks orally. So far it's given a nice boost to her calorie intake. I have made the decision to keep her on it for now and see how she does with gaining weight. 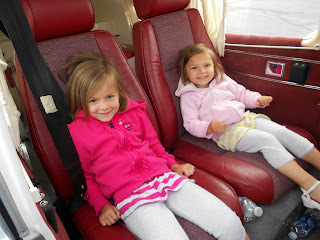 Of course, she continues to struggle gaining weight so I'm hoping the Duo-Cal will continue to help us with this. I don't like adding supplements to Allie's food but since I cannot increase her volume at this point, I need to make her food more calorie dense. So, our appointment went well - really nothing new happened. 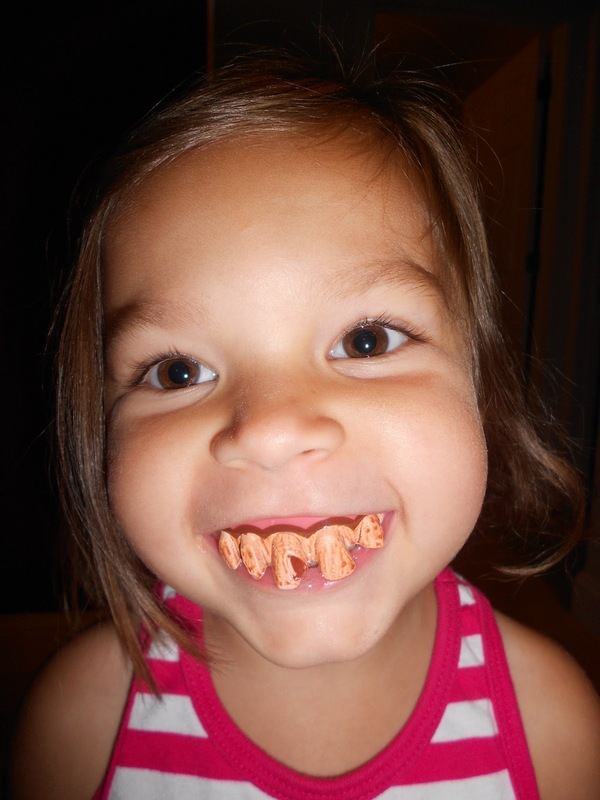 It was a short and sweet appointment and Dr. Brown was very impressed with Allie's progress. We go back in 1 month for a weight check and then we see him again in 2 months. We are going to continue on the path we are on and just pray one day either Allie eats enough calories or the doctors can figure out why she doesn't like to eat orally. While we were at the Children's Hospital the other week, one of the doctors requested that Allie get a full panel of blood work done. This was requested because Allie lost weight that month. They were thinking she was dehydrated and malnourished. They didn't come right out and say it to my face but they were implying it and were definitely not happy she lost weight. Of course, I was more unhappy that she lost weight because I had worked so hard to make her gain. 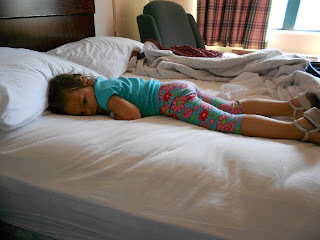 I was mad they would even suggested that I would allow Allie to be dehydrated or malnourished - I love my little girl more than anything and I strive daily to keep her the healthiest that I can. I of course agreed to the blood work because I knew it would prove she is healthy!!!! Everything in the normal range!!!!! However, they are saying her iron is a bit low and they want to discuss that with me further. I have yet to call the doctor back, but according to these levels, I'm thinking she's doing great. I'm going to get a copy of the blood results sent her to her primary GI doctor here in Wausau and see if he thinks her iron is an issue or not. So, as I suspected, Allie is doing great (inside & out). We are continuing to keep her on 4 bolus feeds a day with 5 oz each time. The BD is still working great for her and we have had no vomiting issues. She no longer drinks the E028 Splash (predigested formula) orally, she only likes chocolate milk now. I do sometimes use the E028 Splash in her BD though. Allie started preschool and is loving it. She also is fully potty trained now - finally!!!! She's has grown up so much the past couple months it's amazing. 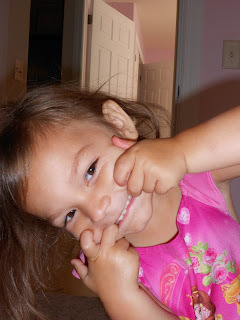 Of course she is still strong willed, demanding and down right sassy but would I really want it any other way???? Allie went in this morning to her GI for a weight check. She started going during the summer when we did her tube wean but since she's been back on tube feedings, we haven't had any weight checks. They called last week and wanted her to come in for a quick weight check - so we did. I'm happy to say that Allie weighed 27.4 pounds. That is the most she has ever weighed - YEAH ALLIE!!! She was 27.2 pounds when we started her tube wean this summer so little Allie has gained all of her weight back and then some! I'm so proud of her. Of course I will be continuing to weigh Allie at home like always - I am always looking for a celebration and Allie gaining any amount of weight it means for a "celebration"! 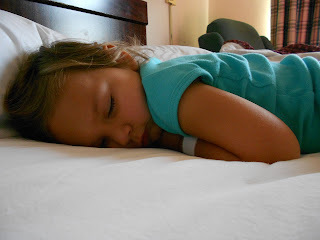 I am still waiting for Allie's blood test results from last week at the Children's Hospital. I'll keep you posted. 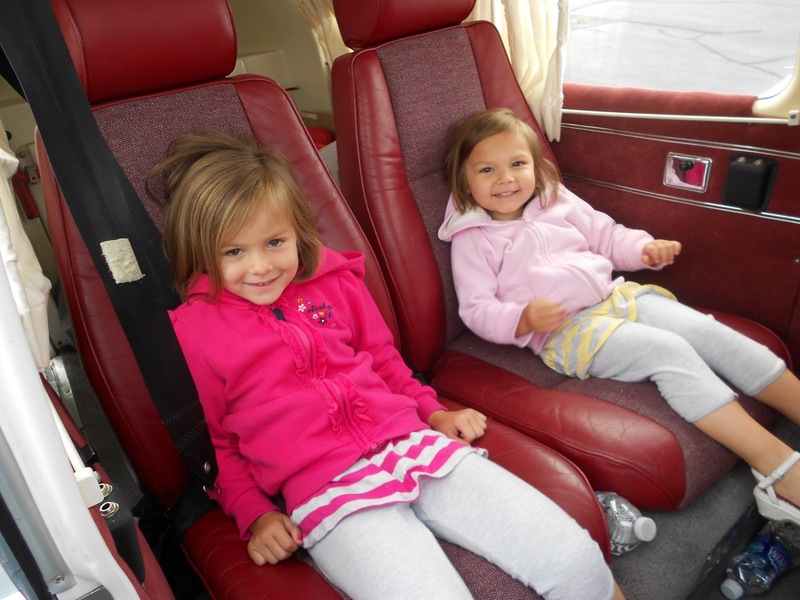 Chloe & Allie in Uncle Mike & Aunt Shannon's new airplane! Yesterday, we received the results of Allie's gastric emptying and intestinal follow through test. After her 8:00 am X-ray, we met with her team of specialist. Both tests came back NORMAL! This is what I was expecting and quite honestly, I would have been completely surprised if it wasn't normal. So, with normal test results, this brings us no closer to an answer but that's okay. We are going to continue to do what we are doing and pray she gains weight. Allie actually lost weight this past month - she lost 3 oz. It's not a lot but for all the calories she's receiving through her tube feedings, she should have gained and not lost. Allie is still not back up to her weight she was before we tried her tube wean this summer - it's just such a struggle for our little peanut to gain!!! After talking to the team of specialist about her normal test results, Matt and I expressed our concerns about proceeding with her endoscopy and botox injection scheduled for today. We just didn't feel there was a good enough need to put her under anethesa again. It's never easy putting your child under when there is a need but I have been second guessing this surgery/procedure since it was scheduled. So, I followed my motherly instinct and expressed my concerns. Dr. Tipnis agreed to cancel based on our concerns. Before leaving, Dr. Tipnis ordered extensive blood work so we headed to the lab. Allie's biggest fear is "men" and her second biggest fear is getting blood drawn. She screamed from the minute we walked into the lab till the minute we walked out. She did good though - she was just crying and screaming because she was nervous, scared and mad. 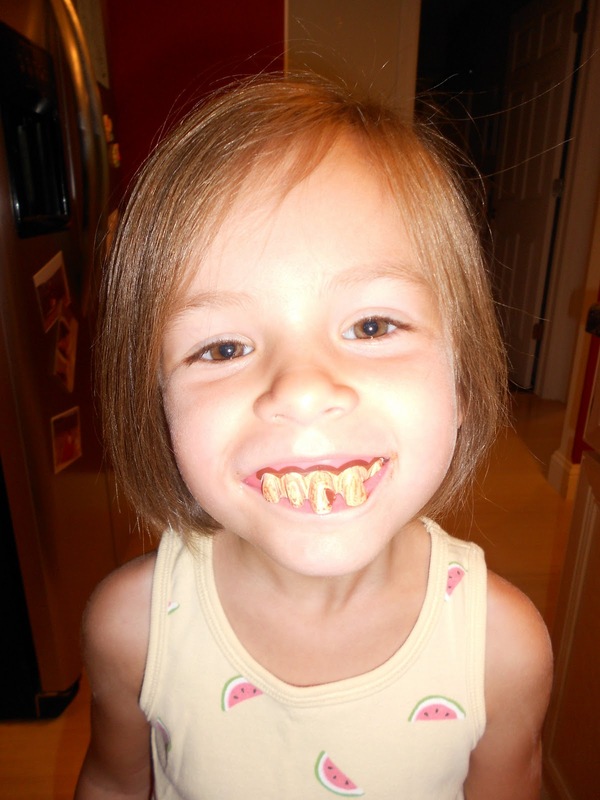 As she get's older and understands more, all the pokes and prods get so much worse. After her blood draw, we packed up and headed home. We got home yesterday afternoon and now we just wait for her blood test results. They are checking her CBC and all of her chemical panels. The Dietician there is very concerned that she dehydrated and somewhat malnourished. She is thinking this because she actuall lost weight. We'll see - I honestly think she's very well hydrated and her nutritional status is great. The blood work will show the true results. So, back to square one and we will continue to chug along. Allie is doing great and so happy to be back at home. She hates the Children's Hospital and when we walked out of there, she said, "I'm never coming back here again". She's in control of that - all she has to do is eat orally - think she'll do it???? Here are a couple pictures of Allie getting her test on Tuesday. Allie loving her new bunny from the Kwick family - thank you!!! As usual, miscommunication with the staff at the Children's Hospital is usually one of our biggest obstacles. 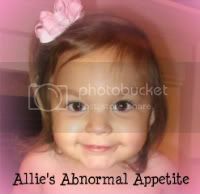 Allie's gastric emptying test began with numerous pages to doctors and specialist. Allie's order stated she needed a gastric emptying test done with liquid. This is not what the doctor and I agreed to at our last visit. Allie was go be fed her blenderized diet and this would show us how her stomach empties with solid food. We know her stomach empties okay with liquids. 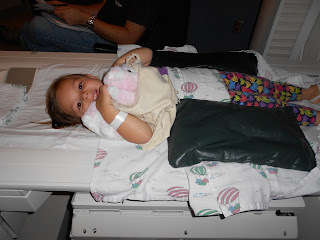 However, the nuclear medicine they use to follow through her system won't attach to solid food so the intestinal transit part of the test had to be done with liquid. I was mad - this is not what Dr. Tipnis and I had agreed to, however if we wanted to check to see if her intestines are working properly, we had to do the test with liquid. Another thing I was upset about is Dr. Tipnis told me he wanted the test done here because they now do a new type of gastric emptying test. With the new test, children don't have to lay on the table very long. The children are able to get up and move around but come back for an X-ray of the stomach every half hour. Well, that wasn't how it worked. They used the same old test of making the child lay on the table for 1 1/2 hours straight. I was not happy!!! One more miscommunication - I received an email from Allie's nurse stating the times we would have to return to X-ray throughout the day for another scan. We were to return there every hour until 4:00pm. 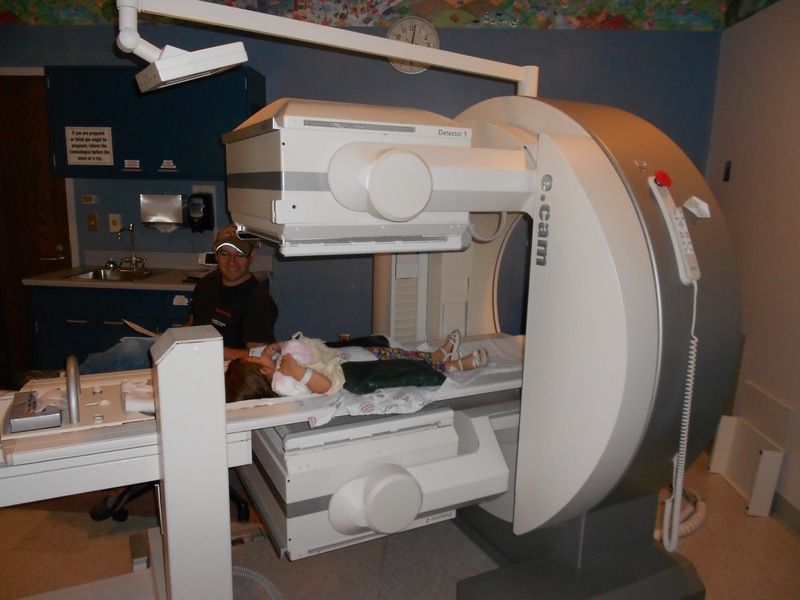 Once we started her scans, the tech said we didn't have to return until 2:00 and after that we were done. 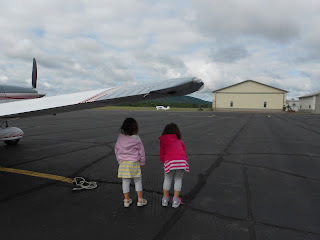 Nothing we talked about at our last doctor appointment turned out right - it makes me very frustrated. I guess this is just another reminder of why I originally moved her care out of the Children's Hospital of Wisconsin! Allie did great with her gastric emptying test - she even actually drank about an oz of the Gatorade with the nuclear medicine in it. The remaining was put into her tube. She laid on the table for the 1 1/2 and cried on and off the last half hour. It was a long time for her to lay there but we were prepared with movies. Allie wasn't scared for the test but just mad because she had to lay on the hard table for so long. But she did awesome!!! We left the hospital around 11:00 and didn't have to return until 2:00. Allie's second scan only took 5 minutes so that was great - she didn't mind that at all. After that, we checked into the Extended Stay hotel. We were not able to get into the Ronald McDonald house today but we are still hoping for tomorrow. Tonight we took Allie to Chucky Cheese. We had never been there before and Allie had a blast. She loved playing all the games and riding the rides. Now we are back in the hotel just relaxing. Tomorrow Allie gets her final X-ray to end her intestinal follow-through test. After that, we meet with her team of specialist to go over the gastric emptying results and intestinal follow-through results. We will also be discussing her endoscopy and botox injection schedule for Thursday. Matt and I are thinking that if her stomach is emptying okay, there is no need for the botox injection - we'll see what Dr. Tipnis has to say. So, our day went well and Allie was a champ through everything. Glad today is over but I'm really dreading Thursday! Thanks for keeping Allie in your prayers - you guys are great!!!! So, tonight we are staying in our little Day's Inn Dive and relaxing. Allie is playing with her little people on the floor and I'm just about ready for bed. I'm nervous myself tonight - it's always such a emotional rush going back to the Children's Hospital, especially knowing we will be here for several days. As always, we will go through this with confidence and we will continue to pray that this procedure and surgery leads us into the direction with answers. I'll keep you updated on how little Allie is doing. I'm expecting my little princess will do wonderful tomorrow!! !